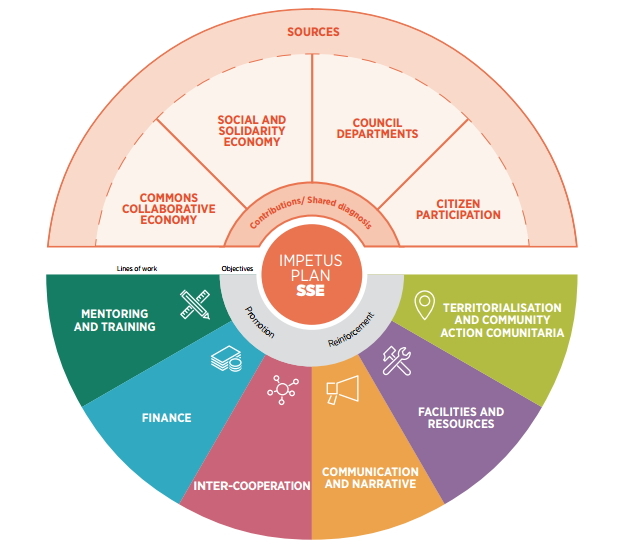 The Impetus Plan for the Social and Solidarity Economy in Barcelona, is the result of a municipal initiative. Its aim is to offer a transformative socio-economic vision of the urban reality. It includes an action programme and aims to contribute towards reducing social and territorial inequalities, while promoting an economy at the service of people and of social justice. The Planning Process: explains the process involved in drafting the Plan and related co-production and co-responsibility dynamics. Contents of the Plan: describes the general and specific objectives, lines of work, measures and actions to be implemented. Development of the Plan: indicates the different agents involved in the Plan’s execution and spaces for joint and participatory work. Budget, Monitoring and Evaluation: details the budgetary allocations, as well as the impact assessment criteria used. Annex. Towards a New Socio-Economic Policy: offers an overview of the plural economy and of the proposal for the city’s socio-economic transformation. As explained below, this Impetus Plan is the product of dialogue between the SSE sector and the City Council, which gave rise to a shared diagnosis. 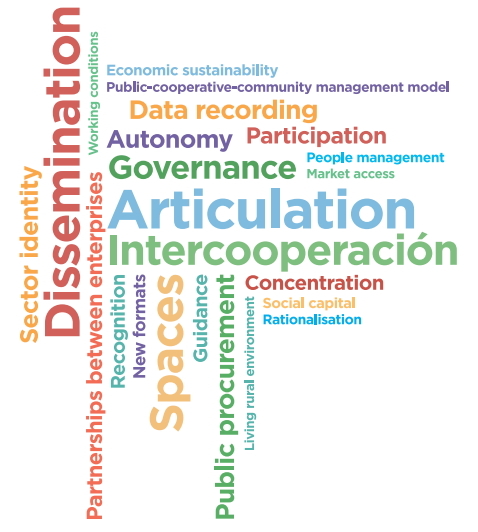 The report The Social and Solidarity Economy in Barcelona developed a compilation of needs that are summarised in the following challenges tag cloud. These challenges, detected by the SSE fabric itself, show those aspects that require input in order to consolidate and strengthen the social and solidarity economy movement. This Impetus Plan contains measures and actions related with these challenges, which often require internal work by the sector itself. In this sense, co-production and co-responsibility in achieving them are essential. To highlight those that enjoy the greatest consensus, efforts need to be channelled towards improving the coordination of the sector in a global sense. This will make it possible to create a greater shared identity; increase communication outreach to disseminate the principles and values of the SSE among citizens; make spaces available to the SSE so that it can become the backbone of neighbourhoods and districts; improve inter-cooperation to strengthen social market construction; place emphasis on disseminating and training in democratic and participative governance as an eminently transformative element; and influence socially responsible public procurement, based on eco-social values, as a fundamental strategy. Meetings were held, along with the sharing of spaces for diagnosis, with BarCola, the collaborative economy hub that groups together 18 organisations. In March http://findviagra.com 2016, the city hosted the Commons Collaborative Economies: Policies, Technologies and City for the People (“Procomuns”) event whose sessions featured participation by over four hundred people and led to a declaration of 120 measures for public policies on commons collaborative economy matters, which were then put forward in the Municipal Action Plan (PAM). According to the study The Social and Solidarity Economy in Barcelona (2016), the city is home to 4,718 socio-economic initiatives that, according to their legal structures, form part of the social and solidarity economy. In total, they account for 53,000 people employed, over 100,000 volunteers, over 500,000 consumer cooperative members and approximately 113,000 mutualists. SSE initiatives exist in all sectors of economic activity: from energy through culture to the food sector. Barcelona is home to 861 cooperatives of all types, representing 20% of all the cooperatives in Catalonia. 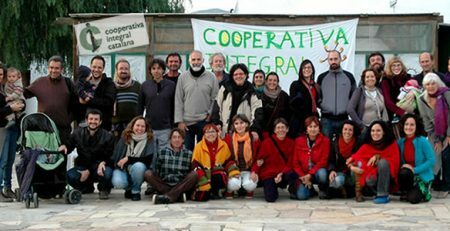 The large majority are worker cooperatives: these account for 77% of the total (numbering 667, of which 36 are social initiative cooperatives). Furthermore, the city is home to 31 consumer and user cooperatives, which operate in a very wide range of activity fields: food, paper, energy, health, etc. Since 1993, the city’s main housing cooperatives have built 2,093 homes in Barcelona, and today a new model is emerging known as housing cooperatives with assignment of use rights. In the education area there are 19 education cooperatives, of which 80% are worker cooperatives, 10% consumer cooperatives and 10% mixed. They concentrate around 2,500 members, over 5,600 students and they employ over 750 people. There are also 13 free schools running plus various child-rearing and shared education initiatives for ages between 0 and 3 years. Worker-owned enterprises enjoy a significant presence in the city: they represent 25.4 % of Barcelona’s SSE enterprise fabric, although a challenge in this sector’s articulation is detected. All local development projects must count on the strength of the third social sector because, with 2,400 organisations in the city, it represents over 50% of SSE initiatives: 48 of them correspond to special work centres and 20 are work integration social enterprises (WISE). The seven ethical finance organisations operating in Catalonia are all based in Barcelona. Furthermore, in the insurance sector, the EthSI (Ethical and Solidarity Based Insurance) seal exists to certify insurance products, brokers and agents in line with SSE criteria. In Spain there are seven certified companies, four of them based in Barcelona. Community economies have emerged in the city as self-managed and innovative projects in the creation of new forms geared towards resolving people’s needs. In this respect, especially worthy of highlight are 23 citizen-managed facilities, 59 agro-ecological consumer groups, 13 exchange markets, 21 time banks and 20 community market gardens. Read the entire document; download the PDF here.